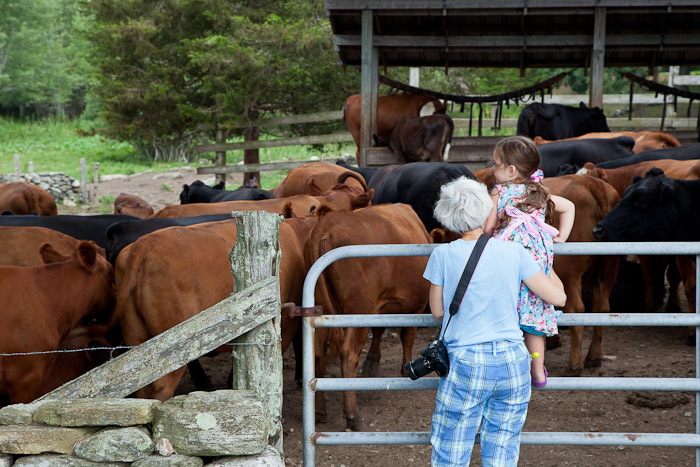 Buttonwood Farm is about 45-minute drive from our house. They make and sell great tasting ice cream, made with milk from their own cows. For years, they have been growing sunflower as feed for their cattle. A few years back the Make a Wish Foundation, which provides a wish for children who suffer from a life-threatening medical condition, asked the farm if they could sell some sunflower bouquets for fundraising and the Buttonwood Farm agreed. Since then, they have increased the amount of sunflower they plant and the foundation benefits from the proceeds of the flower sales. The location is also an attractive spot for area photographers. You will see many photographs in competitions taken around the farm, some with big vistas of flowers others close-up studies. Our local camera club, PSRI had arranged today, July 26, to be a gathering day for photographing the sunflower fields. Jan and I decided to drive down with the kids, Elif, Mina, Leanne, and Margaret as an outing. The drive down was pleasant but I could see growing clouds on the horizon. When we arrived at the four-corners, cows were just on the other side of the fence and the stone wall. Mina enjoyed looking at them up close. I took some photographs of the fields and Mina, and when they arrived in Leanne’s car, Elif, Leanne, and Margaret. I decided it was time to get in the car and no sooner than we closed the doors the sky opened up and started pouring, very hard. We drove to the ice cream shop parking lot and waited in the car until it was light enough for Elif and Jan go out and get some ice cream. The portions are very generous, I could not finish one scoop of raspberry ice cream. Then we drove home. Here are some memory shots from Buttonwood Farm.